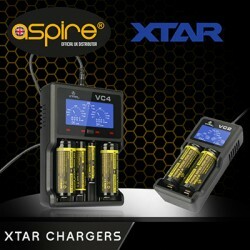 We can now supply our customers with Xtar Chargers at the very best wholesale prices. Founded in 2006 Xtar are now the market leaders for charging bays and related products. This is due to build quality, charging technology and the future product development team at Xtar HQ in China. Take a look through the range of the most desired Skus from XTAR that we have in stock. You can now order your Aspire Hardware, TPD compliant E Liquid and the worlds greatest battery chargers all from the same place. Xtar MC1 Charger The XTAR MC1 Charger is extremely compact and portable. Ideal for travellin..
Xtar MC4 Charger The XTAR MC4 charger is the latest in the MC range. It is another classic to add..
Xtar Panza XP4 The XTAR XP4 Battery Charger is also known as the Panzer 4 Charger. It has four ch..